Hermann Wilhelm Göring, 1893-1946. Nazi Reichsmarshall; Luftwaffe commander-in-chief. Postcard photograph boldly inscribed and signed by Göring, With friendly greetings / Hermann Göring / and Emmy Göring. This is a rare and fascinating association piece. 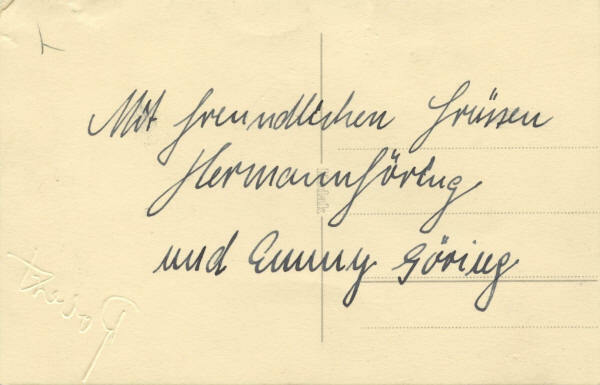 Göring sends greetings from himself and his second wife, Emmy—signing her name for her—on a postcard picturing his yacht, the Carin II, which was named after his first wife, Carin, with whom he remained in love long after her death in 1931. The photograph is a rare original by Göring's valet, Robert Kropp, whose blind-embossed stamp “Robert" appears in the lower right corner. 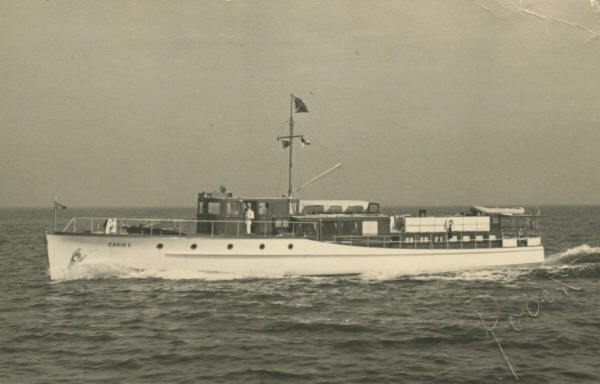 The Carin II, built in 1937, was a gift from the German yacht industry to commemorate Göring's 1935 marriage to Emmy. It was built by the H. Heidtmann Yacht and Motorboat Works in Hamburg. Some 90 feet long and 16 feet wide, it weighed 70 tons and was powered by one 12-cylinder and two six-cylinder Daimler-Benz diesel motors. The interior featured a richly appointed salon paneled in burled walnut. Göring never lost his love for Carin after falling in love with her at first sight. He named his hunting lodge in the Schorfheide Forest northwest of Berlin Carinhall, and he reinterred her body nearby it in an elaborate underground mausoleum on the shores of the Wuckersee. Hitler and other top Nazi officials attended the reinterment ceremony. For years after her death, he maintained a shrine to her in a room in the lodge. His enduring love for her radiated from his inscription to his sister-in-law, in which he referred to “my unforgettable Carin,” in a book that we sold. Click here to see that book. Kropp served as Göring's valet from 1933 until Göring was imprisoned for treason in Mauterndorf Castle by the Germans themselves in 1945. Göring gave Kropp license to take private photographs of him and his family, often with others such as German Führer Adolf Hitler and other German and foreign military and civilian officials, and publish them under his own name. Among Kropp's works are Hermann Göring At Public Events and Other Activities for the respective periods of January-February, March-April, and April-May 1939 and January-May, June-August, and September-November 1940 and Hermann Göring's Activities for the respective periods of June 1-12 and June 13-August 1939, August-December 1941, and January-May 1942. This piece was previously sold by the German auction house Hermann Historica. Göring has inscribed and signed with both signatures in bold blue fountain pen. There are a crease at the upper right corner of the photograph and a pencil mark at the upper left on the back, well removed from Göring's handwriting and signature. Overall the piece is in fine to very fine condition.